Definition at line 62 of file llviewerkeyboard.h. Definition at line 86 of file llviewerkeyboard.h. Definition at line 526 of file llviewerkeyboard.cpp. References FALSE, i, KEY_COUNT, KEY_PAD_DIVIDE, KEY_PAD_UP, mBindingCount, mKeyHandledByUI, mKeysSkippedByUI, MODE_COUNT, and S32. Definition at line 624 of file llviewerkeyboard.cpp. References FALSE, i, KEY_F1, llendl, llerror, llerrs, MAX_KEY_BINDINGS, mBindingCount, mBindings, LLKeyBinding::mFunction, LLNamedFunction::mFunction, LLKeyBinding::mKey, LLKeyBinding::mMask, LLNamedFunction::mName, mNamedFunctionCount, mNamedFunctions, MODE_COUNT, mRemapKeys, NULL, S32, TRUE, and void. Definition at line 545 of file llviewerkeyboard.cpp. References i, LLNamedFunction::mFunction, LLNamedFunction::mName, mNamedFunctionCount, mNamedFunctions, and S32. Definition at line 794 of file llviewerkeyboard.cpp. References LLAgent::cameraMouselook(), gAgent, LLAgent::getAvatarObject(), LLView::getVisible(), gMorphView, LLVOAvatar::mIsSitting, MODE_EDIT_AVATAR, MODE_FIRST_PERSON, MODE_SITTING, and MODE_THIRD_PERSON. Referenced by handleKey(), and scanKey(). Definition at line 588 of file llviewerkeyboard.cpp. 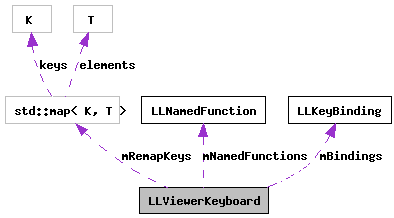 References end, FALSE, getMode(), gViewerKeyboard, gViewerWindow, LLViewerWindow::handleKey(), KEY_F12, lldebugst, llendl, mKeyHandledByUI, mKeysSkippedByUI, mode, and mRemapKeys. Referenced by LLViewerWindow::handleTranslatedKeyDown(), and LLViewerWindow::handleUnicodeChar(). Definition at line 698 of file llviewerkeyboard.cpp. References bindKey(), BUFFER_SIZE, LLFile::fopen(), LLKeyboard::keyFromString(), llendl, llerrs, llinfos, mask, LLKeyboard::maskFromString(), MAX_STRING, mode, MODE_THIRD_PERSON, modeFromString(), and S32. Definition at line 554 of file llviewerkeyboard.cpp. References FALSE, MODE_EDIT, MODE_EDIT_AVATAR, MODE_FIRST_PERSON, MODE_SITTING, MODE_THIRD_PERSON, and TRUE. Definition at line 816 of file llviewerkeyboard.cpp. References LLKeyboard::currentMask(), FALSE, LLKeyboard::getKeyRepeated(), getMode(), gKeyboard, i, KEYSTATE_DOWN, KEYSTATE_LEVEL, KEYSTATE_UP, mask, mBindingCount, mBindings, mKeyHandledByUI, mode, and S32. Definition at line 83 of file llviewerkeyboard.h. Referenced by bindKey(), LLViewerKeyboard(), and scanKey(). Definition at line 84 of file llviewerkeyboard.h. Referenced by bindKey(), and scanKey(). Definition at line 89 of file llviewerkeyboard.h. Referenced by handleKey(), LLViewerKeyboard(), and scanKey(). Definition at line 88 of file llviewerkeyboard.h. Referenced by handleKey(), and LLViewerKeyboard(). Definition at line 79 of file llviewerkeyboard.h. Referenced by bindKey(), and bindNamedFunction(). Definition at line 80 of file llviewerkeyboard.h. Definition at line 87 of file llviewerkeyboard.h. Referenced by bindKey(), and handleKey().